Kate Abbott fell in love with the Amalfi coast and Capri, and no wonder as this area is one of the most heavenly places in the world. It all began with falling in love, not the love that leads to general baying at the moon but rather the deep appreciation and joy of magnificent landscape and vistas, beautiful Villas, architecture, history, places to stay and cuisine to enjoy. 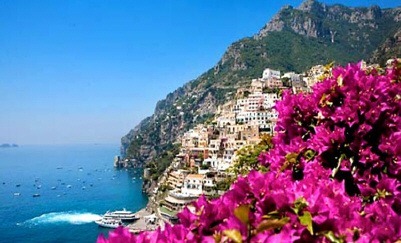 It is the boot, Italy, and to be more specific, this time it is the escape to the Amalfi coast. After spending two days in Rome it was time to head south. 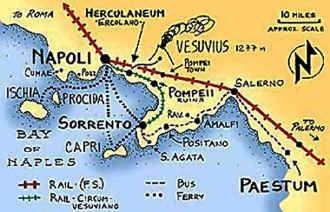 Our destination is Sorrento where we will leave our car and board a ferry for Capri. a paradise of idleness surrounded by the bluest of seas; this dramatically beautiful, flower-covered Island has been enchanting visitors for centuries, as it has me. On arriving at the Marina Grande Capri we are met by staff from the hotel Punta Tragara, our home for the next few days. Our luggage is commandeered as we are guided on to the funicular which takes us up to the top of the imposingly steep cliff to the main piazzetta where once again members of the hotel staff wait to guide us along meandering pathways past exquisite boutiques, restaurants, gardens with cascading bougainvillea, and past 19th century villas, to our hotel. The Hotel Punta Tragara, ingeniously built on the craggy cliffs is perfectly placed on one of the islands most spectacular locations where you have full view of the hypnotic trio, the white marble Faraglioni; three rocky spires which soar an imposing 92 metres above the water where they seem to proudly anchor the south east coast. At sunset the stones blaze like gold with the flashing of the sun on the sea. 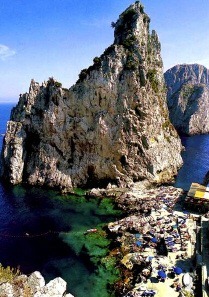 These rocks are one of Capri’s top landmarks. There is so much to see on this little Island, from the colourful port of Marina Grande to the glamorous Piazzetta where the world’s beautiful people hang out; from the ruins of Emperor Tiberius’ villas to the Charterhouse of San Giacomo and the spectacular Via Krupp. You can take the chair lift to the top of Monte Solaro. You can walk along paths leading to incredible rock formations such as the Natural Arch and the Faraglioni. You can marvel at the glimmering blue of the Grotta Azzurra and you can fall in love with Capri just like I did and hundreds and thousands of visitors who came before. Other things to do from Capri: Plan day trips to Naples, Pompeii, Sorrento. An icon of island hospitality, Capri’s Ristorante Faraglioni is famous throughout the world for its excellent traditional cuisine, interesting location, and its celebrity clientele. Restaurant Faraglioni’s tables are set along both sides of the final stretch of Via Camerelle, the pedestrian road renowned for its elegant boutiques and designer fashion stores. Faraglioni’s cuisine is proudly traditional. 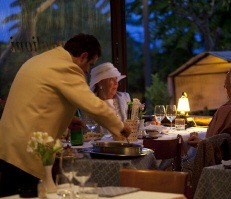 The menus feature the island’s best loved dishes as well as a selection of classic Italian and international specialties. All-time favourites include spaghetti with crab and sea urchin sauce, and the chef’s legendary lemon risotto. 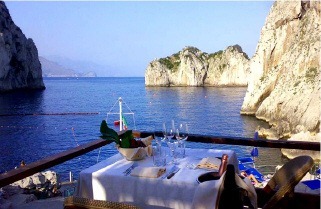 And then there is Da Luigi; few restaurants can boast a location as stunning as that occupied by Capri’s Da Luigi ai Faraglioni. 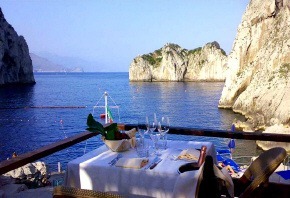 This historic eatery, dating back to 1936, sits on the water’s edge, almost directly beneath the island’s Faraglioni rocks. Here, in the shadow of the legendary landmark, holidaymakers mingle with members of the international jet set, who regularly come to savour the restaurant’s delicious and vast selection of fish and seafood dishes, as well as traditional island specialties. 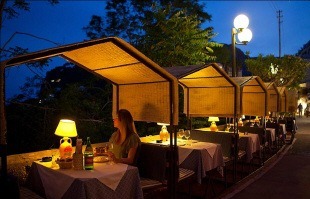 The cuisine together with the unbeatable location, make Da Luigi ai Faraglioni a sought after venue. It is also a much loved bathing area where visitors come to swim and laze in the sun from dawn to dusk. The Via Camerelle boasts an amazingly high concentration of designer shops and here you come across all the big names from the world of fashion. If however you would rather buy something which has been made on the island and which you are unlikely to come across anywhere else, visit the little artisan shops and showrooms. You may not want to leave the island without these three loved souvenirs: A pair of hand-stitched Capri sandals; Capri is famous for its handmade sandals, to acquire a pair all you have to do is walk into a sandal shop where the cobbler will measure your feet while you choose the type of straps you want. Less than an hour later your sandals will be ready. Another typical souvenir from Capri is artisan made perfume. The tradition of perfume making dates back to the 15th century when the monks residing in the Charterhouse of San Giacomo started producing exquisite scents using the island’s wonderful herbs and flowers, a bottle of artisan-made perfume is a great gift. And then there is the famous limoncello made from the fabulously fragrant lemons, which locals like to sip as a digestive. 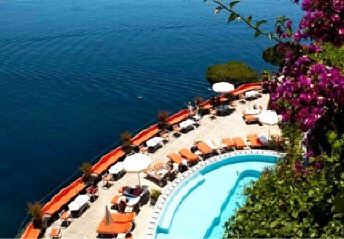 After Capri our destination is Hotel Il San Pietro di Positano, a luxury hotel just 2km from the centre of Positano. Few hotels can boast a position as stunning as the one occupied by Hotel Il San Pietro, with its magnificent views where the lapis lazuli sea seemingly melts into perpetual azure sky in ineffable vistas. The picturesque 5 star hotel, the brain child of the late Carlo Cinque, is ingeniously carved out of the cliffs and hovers a daunting 100 metres above the sparkling bay. 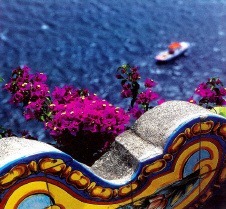 The terraced gardens of roses, bougainvillea, fuchsia and exotic orchids; perfume the air inside and outside the hotel. The décor is simple, elegant, and the refined details such as magnificent pieces of furniture, carpets, and paintings show the San Pietro’s commitment to luxury. The various terraces offer vistas of both the surrounding sea and the imposing Lattari Mountains. One terrace is home to the semi-circular swimming pool. The guest rooms and suites are impressive and each has its own beautiful, private terrace with dazzling views of the sea below. The classic, elegant design of the individually styled rooms and suites provide a plush respite, while modern conveniences such as satellite television and Jacuzzi tubs maximize the comfort factor. 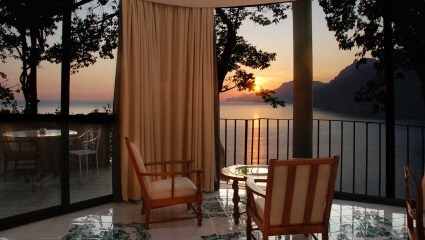 Once inside our suite it was difficult to leave the opulent comfort, the magical vista, and the soft setting sun across the bay of Positano. For me it is truly a little slice of heaven. Hotel Il San Pietro’s panoramic Michelin Star restaurant is touted as one of Italy’s finest eateries. The gourmet restaurant serves classic Italian cuisine, prepared with the freshest seasonal ingredients along with the fabulous extra virgin olive oil produced from the fruit grown in Il San Pietro’s own olive groves. It certainly lives up to all that and more. Guests have the opportunity to use any of the hotel’s excellent leisure facilities, including the large swimming pool, tennis courts, and Fitness Centre. The hotel’s wellness facility offers a superb selection of face and body treatments, performed by highly trained therapists. An elevator carved into the steep cliff-side escorts guests at dizzyingly speed to the private beach below the hotel, located in a natural cove and surrounded by crystal clear water. Lounge beds and umbrellas create a comfortable environment while you sip a beverage from the seaside bar or laze in the sun. Guests can explore the coastline with a complimentary boat excursion in the morning; alternatively, a private boat charter is available through the hotel, taking you anywhere along the coast and Gulf of Naples in complete privacy. There are a variety of beautiful hotels, villas and apartments in Positano; we chose the Hotel IL San Pietro as our base for the week, because of the comparative quietness of its position and its perfect location from which to explore Positano and other beautiful and historical places along the coast of Amalfi. The picturesque town of Positano, its enchanting position, and delightful houses, villas and gardens which cascade dramatically down the mountainside, represent the epitome of Mediterranean charm. 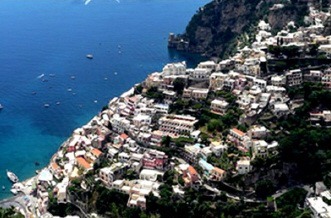 The Amalfi drive snakes its way along the Amalfi coast, and around each and every bend in the road splendid views of the small towns, secluded bays, and deep gorges, pop into view. The road winds its way through dramatically beautiful landscape of lush green Mediterranean flora and striking rock formations, leading to towns of worldwide fame such as Positano, Amalfi, Ravello, and Salerno, but also to lesser known, yet just as magical, places like Praiano, Atrani and Furore and further on it goes to Maiori, Minori, Vietri sul Mare, and Paestum, all of which gaze out across the Gulf of Salerno. 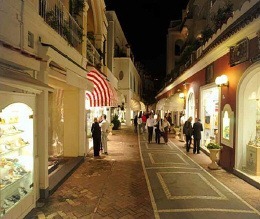 Positano: Is not only an International tourist destination but also an important centre for fashion design. 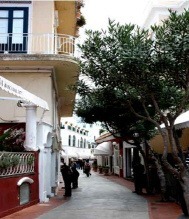 One of the town’s major attractions is its vast array of boutiques lining the narrow lanes and alleyways with their displays of colourful garments, typical of the town. Visit the prehistoric caves, the Li Galli islands, the Roman Villas and underwater archaeological remains. 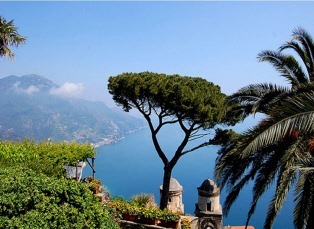 During the summer season visitors can attend events such as the Festivals held at Montepertuso and Positano, and the International Art of Dance Awards. Amalfi: The town of Amalfi has its own charm; piazzas, shops, pastel houses, a picturesque harbour and the dizzying precipices that drop straight into the sea. If you have a head for heights pace along the quarter-mile-long promenade, the village of Amalfi unfolding far beneath you in a splendid panorama from where you soak in the sublime beauty of the place and surround. Visit Hotel Cappuccino’s for lunch and for food lovers don’t forget to pay a visit to the Hotel Luna Convento’s cooking school. Buy some Amalfi writing paper. 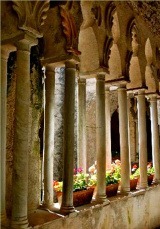 Ravello: Quiet, tranquil and stunningly beautiful. Here you will find Villa Rufolo, a magnificent estate with terraced medieval gardens where voluptuous wisterias, scarlet sage, cyclamen and bougainvillea pay homage to all who have gone before. The terrace overlooks the entire bay of Salerno, past the Minori valley and Capo d’Orso and on to the Cilento Mountains. 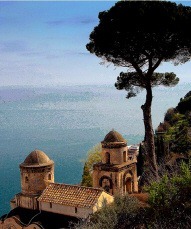 Most people visit Ravello to view the magnificent Villas and gardens. Stroll down Villa Cimbrone’s ‘Allee of Immensity’, past pergolas and rampageous roses, to the Belvedere of Infinity, a magnificent stone balcony that overlooks the Gulf of Salerno and the Universe. There is so much more I would like to see, but sadly it is time to leave. 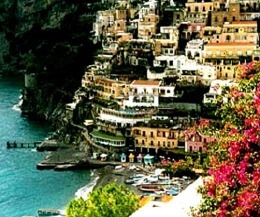 I am in love with the boot, the amazing Costa Di Amalfi, and the wonderful cuisine. What to wear: Locals and visitors alike are snappy dresses. 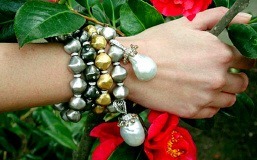 Pack a few classical pieces that you can dress up or down with well-chosen accessories for that effortlessly chic look. Seafood so beautiful and fresh tends to features prominently on the menus. But no matter what you choose, the focus is on fresh, local, organic, minimal fuss and maximum flavour. Here are a few recipes that will hopefully transport your taste buds on an inspiring gastronomic journey. A lovely pesto sauce which is enjoyed all over Italy; serve with pasta, on Panini, bruschetta, or use it to spice up a risotto. 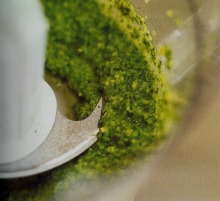 Place the rocket, walnuts, pine nuts and garlic in a food processor, blend until finely chopped. Add the butter and oil and process for a few more seconds until creamy. Place the mixture in a bowl; add the cheeses and seasoning and mix to incorporate. Place in a clean jar and refrigerate. Use to flavour pasta and risotto, enjoy on a bruschetta, panini or pizza, drizzle over some steak, a hot potato, or use blended in a salad dressing. This mixture will keep in the fridge for about a week; if it lasts that long! Seafood, lovely and fresh, is abundant along the Amalfi coast and in this recipe the delicate flavour of prawns is gently enhanced with a dash of Dry Marsala. Place a pan over medium heat, add olive oil, garlic and chilli and heat gently for a few minutes until fragrant, about 4 minutes. 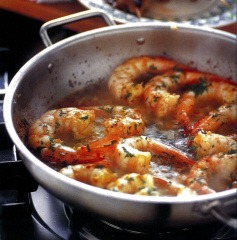 Add prawns and sauté over medium heat until they begin to change colour, about 5 minutes, depending on size. Turn up the heat, season with sea salt and add Marsala wine, cook for a few more minutes, allowing the wine to evaporate, and then mix in the parsley. Serve with a salad and some nice fresh bread. 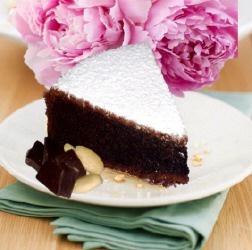 Torta Caprese is a lovely dense blend of almonds and chocolate; this recipe dates back to the 1930’s and is a popular treat on Capri. Preheat the oven to 180ºC. Place the sugar and butter in a bowl and mix together until creamy. Add eggs one at a time, incorporating well after each addition until all are absorbed in the mixture. Then add chopped almonds, chopped chocolate and vanilla. Butter and flour a tart pan or cake tin, diameter about 25 cm. Add the mixture to the pan. Place the pan in a pre-heated oven and bake for 40 minutes. Take it out of the oven, leave to cool. Dust with icing sugar.